Dacia Pajé graduated from law school at "Università degli Studi di Milano" in Italy, where she comes from. During her studies, she became interested in the human rights field and started studying Korean, Korean culture, and history. She finished her Master's degree in Communications for International Relations at IULM University in Milan, where she has been able to improve her knowledge about North Korean issues, bring in project work, and involve her collegues in the issues. While working at HRNK, she is also writing her thesis for her Master's degree: "Through the analysis of North Korea's history and traditions, explain its communication and diplomatic strategy in the international field, with a particular focus on the UN, the EU and Italy." She is a former HRNK intern. What Senator Razzi says rings true. Sports are a peaceful link, and a promoter of peace and fraternity. At least, this is what sports are among people. Recently, even ROK President Moon Jae-in stated: “If the neighboring countries in Northeast Asia, including North and South Korea, can host the World Cup together, it would help to create peace in North and South Korea as well as Northeast Asia”, identifying once again sport as a peaceful tool. However, in North Korea, everything is connected to the Korean Worker’s Party (KWP) and sports become another tool for the regime to impose its power and will on its people as well as international players. In Europe, several young North Korean players are training to become “better than Messi,” according to a motto at the Pyongyang International Football School. As indicated by Italian talent scout Giulio D’Alessandro, there have been more than 30 young players from North Korea training in Spain and Italy in the last few years. Relations between Italian Soccer Management (ISM) and the [DPR]Korea Football Association (KFA) started when an Italian delegation composed of Senator Antonio Razzi, Alessandro Dominici (owner of 40% of ISM), and Matteo Salvini (Lega Nord secretary) traveled to North Korea from August 25th to 31st, 2014. Han Kwang-song, an 18-year-old North Korean player, is considered one of the most talented 50 players under 18 in the world by the The Guardian. He started in Barcelona, Spain with Fundaciớn Marcet and then moved to Perugia, Italy with the ISM. Article 19 of the Fédération Internationale de Football Association’s (FIFA’s) regulations for non-EU minors’ transfers states that academies can register their players after they turn 18. This is how Han and other North Korean players, including Choe Song-hyok and Pak Yong-gwan—both born in 1998—arrived in Italy as students while training at ISM. However, this is also where their paths diverged. In March 2016, after turning 18 (date of birth: 02/08/1998), Choe was registered at the ACF Fiorentina with a “youth of league” contract, which means that he plays without pay and is regulated by article 33 of the Italian Football Federation rules. Article 33 of the same regulations indicates that young players (from 14 to 19 years old) only have the right to a final training compensation, and only during their last season with that particular club. The amount is paid annually, as defined by the league. The negotiation had a positive conclusion, even though the Italian Football Federation could confirm neither Choe’s original club (allegedly Chobyong Sports Club) nor a possible economic transaction between the old club and the new one, Fiorentina. 2) The young player has not been granted the full rights that Italy guarantees to everyone else within its territory. When abroad, North Korean soccer players and North Korean workers in general are accompanied by members of the State Security Department (SSD). Choe is allegedly under the custody of a guardian named Jong Sang-hoe, who is the team manager of the DPRK under 16 National Team, which trained in Perugia, Italy for at least six months. Choe was forbidden from giving interviews not related to soccer matters. The Parliament interrogation did not receive a formal reply from the Italian government, but Fiorentina discharged Choe and 14 other North Korean players immediately after the interrogation started, which could appear suspicious. Like Choe Song-hyok, Han was also allegedly trained in the Chobyong Club. During the 2014 Under 16 Asian Championship in Thailand, he was captain of the DPRK national team, leading it to victory and qualifying for the Under 17 World Cup in Chile the following year. After these successful international appearances, Han was noticed by the Italian Soccer Management (ISM) and arrived in Perugia, Italy, in 2017. He started earning the minimum federal income for training (1,500€ per month), which is required to go to Han’s personal bank account. One of the original concerns of the Italian Parliament was the actual destination of this money, which was supported by the findings that between 70% and 90% of the salary of North Korean workers abroad goes directly to the North Korean regime. The parliamentary investigation led by Michele Nicoletti, Partito Democratico (PD) Deputy, earlier this year, came to just the recommendation to the Italian Government to control soccer clubs’ payment procedures, assuring that the transfers go to the North Korean players and not to North Koreans authorities, in order to fulfil the worldwide embargo on North Korea. Kim Un-hyang, an artistic gymnast, became a gold medalist. The DPRK delegation won 11 gold, 11 silver and 13 bronze medals, for a total of 35 medals. 1966 Soccer World Cup: North Korea upset Italy 1-0 in Middlesbrough, England, one of the biggest surprises in the history of the competition. North Korea advanced to the quarter finals (round of eight, only 16 teams advanced to the World Cup back then). In a memorable quarter final match, North Korea lost to a legendary Portugal side featuring iconic footballers Eusebio, Torres, Coruna and others, 5-3 after having been up 3-0 in the first half. Until South Korea qualified to the semi-finals (round of four) of the 2002 World Cup it co-hosted with Japan, North Korea’s 1966 performance was the best ever by an Asian team. Given that training is expensive for the regime and resources are scarce in North Korea, it is remarkable that these athletes have been able to win international competitions. But their results are also the result of obsessively intense mobilization of available resources by the North Korean regime. These athletes are pressured to win for the “glory of their Leader.” In 2012, during the London Olympics, North Korean medalists affirmed that their success was possible thanks to their leader, Kim Jong-un. Om Yun-chol, male gold medalist in weightlifting, said, “I won first place because the shining supreme commander Kim Jong-Un gave me power and courage.” Again, in 2016, after winning the female gold medal for weightlifting at the Rio Games, Rim Jong-sim said, “The first thing I thought when I knew I had won was that I had made our beloved leader happy.” Winners of gold medals are given the title of “Honorable Athlete” or “People’s Athlete” and receive gifts from the government, such as luxurious cars and houses. The relationship between sports and the regime is not that several athletes belong to the army—this happens elsewhere in the world—but that the North Korean athletes are trained under the control of the State Physical Culture and Sports Guidance Commission, established in 2012 by Kim Jong-un. It was originally under the authority of the National Defense Commission (NDC), but is now under the State Affairs Commission (SAC), whose First Chairman was Jang Song-taek. After Jang’s execution, Choe Ryong-hae, one of the most powerful men close to the Supreme Leader, quickly filled the position of First Chairman. Soccer in North Korea is controlled by the KFA, established in 1945 and directed by Ri Yong-mu, a Lieutenant General in the KPA. The KFA is a member of both FIFA (since 1958) and AFC, the Asian Continental Federation (since 1954), but it does not follow their transfer regulations. Usually, soccer clubs make money from ticket sales, bonuses received from advancing in international competition, private donations, advertising sponsors, or from transferring their players. In North Korea, it is the government that finances the soccer clubs, essentially taking over the decision-making process and controlling the budget. To emphasize, it is the regime which finances soccer clubs and is actually the only institution with the money to do so. Moreover, the Department of Sports, which has hegemonic control over all sports, is a KWP office. Thus, when a club buys a North Korean player, it is essentially handing money to the Kim regime. In 2013, Kim Jong-un opened the Pyongyang International Football School, making his will to make soccer a top priority in the country very clear. With global attention on the North Korean nuclear program, sports are considered a chance to divert attention. With approximately 200 boys and girls from 10 to 14 years old, the soccer academy also functions as a school with classrooms, lecture halls, and dormitory rooms. However, only the most talented players are sent abroad, mostly to Italy and Spain, to receive professional training. "We are training our students to become super-talented players who can surpass the skills of people like Lionel Messi," said Ri Yu-il, one of the school’s coaches. They are aware of the great importance of foreign expertise, and for this reason, the men’s national team manager is a Norwegian coach, Jorn Andersen. Nonetheless, Andersen recognizes how difficult it is to train players who cannot go outside the country to compete against better-trained international players. In North Korea, young players can only learn and study the techniques of great players, such as Zinedine Zidane, Lionel Messi, and Cristiano Ronaldo, by watching videos on CDs and USBs on their computers. "My national players are with me but they don’t get match practice. They are always training, training, training ... but they don’t play matches," Andersen affirms. “Half the stadium’s seats are assigned to civilians—who in summer all wear white hats, white shirts and red ties—while the other half is allocated to the military. Match marshals control the crowd with flags, instructing them to chant or applaud with wooden mitten clappers […] After every goal the crowd claps in unison and—if the Supreme Leader is present—the whole of the scoring team rushes forward to stand before him and salute.” This is how Ri Myong-guk, a soccer player from Pyongyang City Club, described a match in North Korea. Attending a soccer match in Pyongyang is like attending one of the national parades honoring the Leader. One must cheer for the national team as one would cheer for the North Korean regime. To make matters worse, supporting and participating in these soccer events is demanding and expensive. People simply do not have enough money to attend matches in Pyongyang and are not able to go abroad to support their national team. Furthermore, the shortage of electricity means that during global sporting events, watching soccer matches on television is difficult and exclusively for the elite. 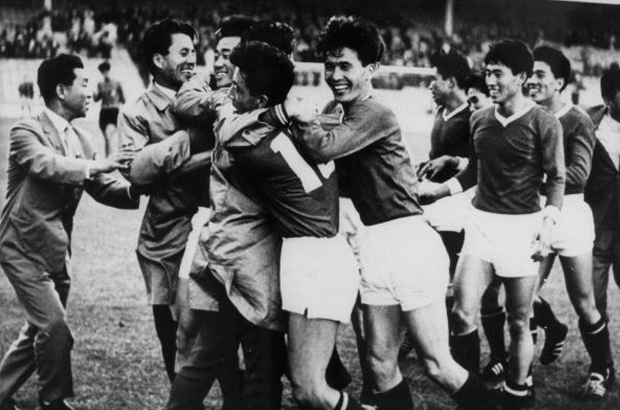 In 1966, North Korea beat Italy during the World Cup in England, granting the DPRK national team international media attention. However, it was not until 2002 that a BBC crew obtained authorization for entering North Korea to film a documentary on the team entitled “The Game of their Lives.” After ten months of training—including a tour in Russia—the North Korean players demonstrated their skills and shocked the world with their fast game, named after North Korea’s, Stakhanovite public mobilization campaign, Chollima, under Kim Il-sung. FIFA had “checked all of its sources,” no evidence of coach or team safety was provided. This was not the only issue North Korea has encountered with FIFA. Some members of the DPRK women’s team were banned from the 2015 Women’s World Cup for steroid use—the result of a traditional medical treatment called musk deer gland therapy. Furthermore, FIFA’s issues with North Korea have steadily extended into the political realm. In 1966, there were problems getting the DPRK national team to England to play against countries that did not officially recognize the nation. However, over the past 14 years, FIFA has provided North Korea with a total of $2 million in funding, $450,000 of which was delivered in 2001 to improve the Kim Il-sung Stadium in Pyongyang. Funds were also allotted to upgrade the training camp for the national soccer team, the headquarters of the North Korea Football Association, and to open the International Soccer School for children under 13 in 2014. Last year, an additional $7,678 was provided for domestic soccer development, maintaining fields, and training adolescents and referees. However, policy changed following the nuclear tests in 2006 and 2009, and the satellite launch in 2012. Finally, in March 2015, FIFA renounced its plans to provide $1.66 million in financial assistance to the North Korean Football Association. This funding would have come from FIFA’s Financial Assistance Program (FAP), intended for nations that lack the resources to support a national soccer program. FIFA is based in Switzerland and has to respect the sanctions of the Swiss State Secretariat for Economic Affairs (SECO), implementing and intensifying UN sanctions and travel bans on North Koreans suspected of having ties to the country’s nuclear program. For these reasons, FIFA is no longer able to provide North Korea with financial assistance. This analysis is not intended to dismiss the importance of cooperation in soccer or other sports. The scope of this analysis is rather, to argue that when it comes to North Korea, sports simply cannot be separated from politics. In North Korea, political considerations dominate every single aspect of life in the country. Nevertheless, despite the threat North Korea poses to international peace and security, both inside and outside the country, the DPRK national team was able to play in the qualifiers for the 2018 Russia World Cup. Soccer clubs all over the world still conduct negotiations with suspicious North Korean clubs. Han’s team, Cagliari Club, is hosting and training another young North Korean player, Pak Yong-gwan (born in 1998), who comes from the same club, Chobyong. The Italian government has neither direct links nor apparent relations with the North Korean regime. But ignoring the atrocities committed inside the country is unacceptable. Hosting and paying two, three, or even ten soccer players in Italy may not provide massive financial assistance to the North Korean regime, but conducting any business with the North Korean authoritarian dictatorship should be taken much more seriously by the Italian government. Italy has a diplomatic and political role in the international community and has recently implemented the UN’s sanctions on North Korea—withholding approval for the entrance of newly-appointed North Korean diplomats into the country and forcing some North Korean students in Italy to change their major from nuclear-related issues. Moreover, on January 1, 2017, Italy became a non-permanent member of the United Nations Security Council, meaning that it should set an example for the international community in regards to implementing and respecting United Nations sanctions. Controversy should be avoided. Even if soccer organizations are allegedly not directly affiliated with the government, they are under strong regime control in North Korea. Of course, Han and Choe are not the problem. Instead, Han and Choe could be the solution. They are not just great soccer players, they are human beings, and they should not be used as propaganda tools, hiding and diverting attention away from the ongoing atrocities committed within their country. -Lia Quartapelle, Partito Democratico (PD) Deputy. Translation. “Razzi: Visto Han? Dei nordcoreani bisogna fidarsi”, Gazzetta dello Sport, April 26, 2017, http://www.gazzetta.it/Calcio/Serie-A/26-04-2017/razzi-visto-han-nordcoreani-bisogna-fidarsi-190994822513.shtml. Forza Italia is an Italian moderate-right wing’s party, whose ideology includes the Christian-democratic values and liberalism. Its president, since the foundation in 1994, is Silvio Berlusconi (former Italian Prime Minister), official website http://www.forzaitalia.it/index.htm. Senator Razzi is a member of Forza Italia and was elected at the Italian Senate in 2013; recently, he was nominated Secretary for the Senate Defense Commission, http://www.senato.it/leg/17/BGT/Schede/Attsen/00023054.htm. Video. AFP news agency, November 4, 2016, https://www.youtube.com/watch?v=FD4FqthB8SA. Lega Nord is an Italian right-wing party founded in 1989, whose ideology includes federalism, social conservatism and anti-globalization; they ask for the independence of Padania, a huge territory consisting in several regions in the north of Italy; among their political proposals they also ask to leave the European Union (EU), and to close the borders to immigrants. Official website http://www.leganord.org/index.php. Giulia Pompili, “Che succede se arrivi alla Fiorentina da Pyongyang? Storia incredibile di mr Choe”, Il Foglio, March 22, 2016, http://www.ilfoglio.it/esteri/2016/03/22/news/che-succede-se-arrivi-alla-fiorentina-da-pyongyang-storia-incredibile-di-mr-choe-94044/. The Italian academy offers to young athletes U18 from all over the world international scouting programs. Fedor Tertitskii, “North Korean footballers in Russia”, DailyNK, February 2, 2009, http://www.dailynk.com/english/read.php?cataId=nk00100&num=4510, the author mentions it as “NSA,” but the standard HRNK translation is “State Security Department (SSD). “Can N. Korean footballer join Serie A amid sanctions?”, Yonhap News Agency, March 7, 2017, http://english.yonhapnews.co.kr/focus/2017/03/06/86/1700000000AEN20170306012200315F.html. Luca Gunby, “Kwang Song Han: the First North Korean To Score In Serie A”, Forza Italian Football, April 13, 2017, https://forzaitalianfootball.com/2017/04/kwang-song-han-the-first-north-korean-to-score-in-serie-a/. Translation. Paolo Tomaselli, “Han, da Pyongyang a Cagliari per scrivere la storia”, Corriere della sera, April 10, 2017, https://www.pressreader.com/italy/corriere-della-sera/20170410/282587377836177. Yoon, Y., and Lee. S., “Human Rights and North Korea’s Overseas Laborers: Dilemmas and Policy Challenges”, Database Center for North Korean Human Rights, 2015. “Han Kwang-song, primo nordcoreano a segnare in serie A: merito di Antonio Razzi”, Libero, April 10, 2017, http://www.liberoquotidiano.it/news/sport/12354292/han-kwang-song-calciatore-nordcoreano-cagliari-gol-record.html. Brian Benedictus, “Golf and Lighting: the Odd Realm of North Korean Sport”, The Diplomat, August 28, 2014, http://thediplomat.com/2014/08/golf-and-lightning-the-odd-realm-of-north-korean-sport/. Jinhyok Park, “Ask a North Korean: How is sport viewed in the DPRK?”, NK News, July 14, 2016, https://www.nknews.org/2016/07/ask-a-north-korean-how-is-sport-viewed-in-the-dprk/. Louise Boyle, “Dear Leader, we’re doing great in London: How did North Korea end up sitting FIFTH in the Olympics medal table?”, The Daily Mail, August 1, 2012, http://www.dailymail.co.uk/news/article-2181855/Olympics-2012-North-Korea-fifth-medals-table.html. “North Korean weightlifter says Olympic gold will make ‘beloved’ Kim Jong-un happy”, The Guardian, August 13, 2016, https://www.theguardian.com/sport/2016/aug/13/north-korean-weightlifter-says-olympic-gold-will-make-beloved-kim-jong-un-happy. Danny Nazareth, “The curious case of North Korea’s national football team”, Sportskeeda, October 30, 2015, https://www.sportskeeda.com/football/curious-case-north-korea-national-football-team. “North Korean football: a big mystery of FIFA football”, The Paths Less Travelled Blog, January 14, 2011, https://thepathslesstravelled.wordpress.com/2011/01/14/north-korean-football-the-big-mystery-of-fifa-football/. “Pyongyang football school opens to foreign tourists”, NK NEWS.ORG, June 24, 2014, https://www.nknews.org/2014/06/pyongyang-football-school-opens-to-foreign-tourists/ . Agence France-Presse, “Pyongyang International Football School: The academy aiming to produce North Korea’s Lionel Messi”, The National, Sport, November 15, 2016, http://www.thenational.ae/sport/asian-football/pyongyang-international-football-school-the-academy-aiming-to-produce-north-koreas-lionel-messi. Rory Mclean, “A day in the life of North Korean footballer Ri Myong-guk”, The Guardian, May 14, 2015, https://www.theguardian.com/world/2014/may/15/north-korean-footballer-ri-myong-guk. Daniel Gordon, “the Game of their lives”, 2002, https://www.youtube.com/watch?v=rG-ivV-ps50. Justin McCurry, “North Korea’s failed World Cup footballers undergo public mauling”, The Guardian, July 30, 2010, https://www.theguardian.com/world/2010/jul/30/north-korea-footballers-public-mauling. “North Korea cleared of ‘foul’ play by FIFA”, CNN, August 26, 2010,http://edition.cnn.com/2010/SPORT/football/08/26/world.cup.korea.coach.assurances/index.html. The gland comes from musk deer living in a large area of Asia, from Siberia to North Korea. The hairy gland is 4cm and it is usually cut open to extract a liquid used for medical purposes. As a matter of fact, it is classified as a resuscitation-inducing aromatic herbs that can stimulate central nervous system if taken orally or relieve pain and reduce swelling in external application. Jinkuk Kim for RFA’s Korean Service. Translated by Yunju Kim. Written in English by Joshua Lipes. “FIFA to withdraw Funding For North Korean Soccer Develpoment”, Radio Free Asia, March 12, 2015, http://www.rfa.org/english/news/korea/fifa-03122015144548.html. “FIFA to Withdraw Funding For North Korean Soccer Development”, Radio Free Asia, March 12, 2015, http://www.rfa.org/english/news/korea/fifa-03122015144548.html. The DPRK team was eliminated in Round 2 of the qualifying campaign, in June 2015. Translation. “Calciomercato Cagliari, Pak Yong-gwan è il secondo nord-coreano”, Sky Sport, March 24, 2017, http://www.corrieredellosport.it/news/calcio/calcio-mercato/2017/03/24-23354972/calciomercato_cagliari_pak_yong_gwan_e_il_secondo_nord-coreano/?cookieAccept. “Italy implements sanctions on N. Korean diplomats”, YonhapNews Agency, April 10, 2017, http://english.yonhapnews.co.kr/search1/2603000000.html?cid=AEN20170310002500315&__s=nqizptkv2ihqtpfcq2yd. Translation. Giulia Pompili, “L’inchiesta del Foglio sul calciatore nordcoreano in Italia finisce in Parlamento”, Il Foglio, May 26, 2016, http://www.ilfoglio.it/italia/2016/05/26/news/linchiesta-del-foglio-sul-calciatore-nordcoreano-in-italia-finisce-in-parlamento-96601/.